At least that’s the mantra shaken bulls are repeating after renewed selling in once high-flying technology shares and angst over a trade war sent the S&P 500 tumbling to the lowest level since early February. 17 percent, up from 13 percent at the start of January. There were few signs of such optimism Monday, as overnight weakness quickly turned into a rout. Tweets from President Donald Trump attacking Amazon.com Inc. sent big tech shares careening lower, while a report that Apple Inc. might ditch Intel Corp. rattled high-flying chipmakers. In the background was news that China issued retaliatory tariffs on $3 billion of American goods, stoking trade anxiety. 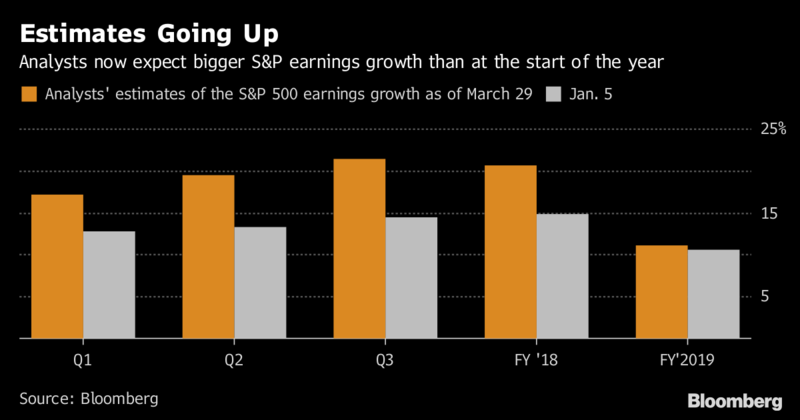 While investors have pulled money from tech shares, analysts expect the sector to carry the earnings load, according to Bloomberg data, at least in the first quarter. They forecast the largest group by weighting in the S&P 500 to increase profit by 25 percent in the period, with chipmakers pushing profits higher by 31 percent. Banks should pick up the baton as the year wears on, the analysts predict, lifting profit growth in the S&P 500 to 21 percent in the third quarter. If during the coming reporting season companies warn that those heady targets might not be met, that could spell immediate trouble for already wobbly U.S. stocks. With quite a few unknown factors ahead, investors in general remain optimistic, according to a survey conducted by RBC Capital Markets. About 45 percent of investors polled by the firm in late March said they were bullish or very bullish on U.S. stocks, even as about the same number of investors said they became less optimistic in the past three months.